Do I guess right that when the vacuum drops, the balls drop and admit more fuel? Very good question. I assumed that as the vacuum increased the balls lifted of their seats for more fuel. Thinking about it, in situations were the vacuum is low but you need more fuel like acceleration or going up hill, your question makes sense. 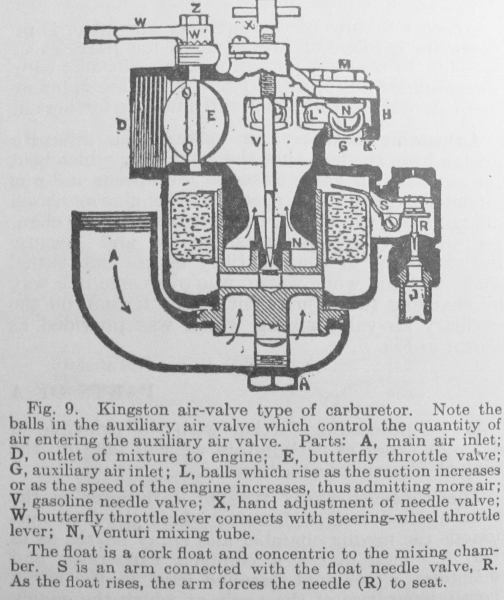 According to Dykes description on the Kingston ball carb, 'balls which rise as the suction increases or as the speed of the engine increases'. The purpose of the balls is to admit more air to lean the mixture as there is no idle circuit in the Kingston ball type carbs. Therefore there has to be an enrichment feature for starting and running at low speeds when the air flow is less. The larger sizes of 4 & 5 ball carbs use a mixture of brass and steel balls to adjust the rise of the balls to regulate how much air is being admitted to the mixture from the needle. The ball caps also vary as to how much they will allow the balls to rise. I have not seen it on T 4 balls but some of the 5 balls have 1/16 embossed on the caps, 3/32, etc. That is the distance the balls are allowed to rise off the seat. Since the T carb is adjustable from the driver's seat it is not so critical but on a tractor or stationery engine it can make quite a difference. Thank you Dan and Stan. I have wondered too.